Tripod counter stopped counting. Added Bravenet counter Previous vvisitor count not known. Aug 22, 03 New counter. Count was 244. WStarted Count at zero. NO UPDATED WILL BE ADDED TO THE SITE. Visit Bob's Homepage for more information. This web site is dedicated to the World War II Crewmembers and families of the USS HALFORD DD480. Built by Robert E. (Bob) Ross, RMCS, US Navy (RET) who served on the USS HUDSON DD475. Thanks to everyone who contributed information and photos. The officer in the foreground is the Skipper Commander, Robert J. Hardy, (retired w/4 stripes). 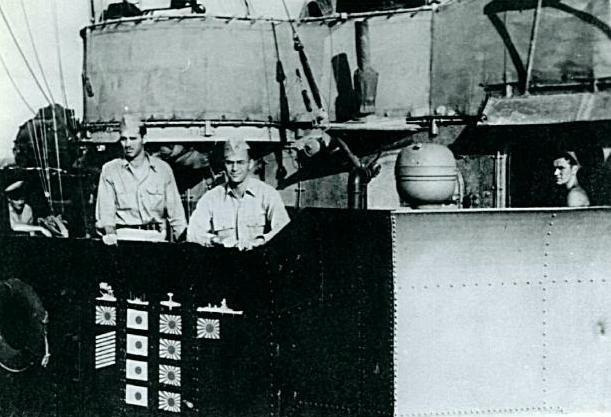 Next to him is Don Dertien, Lt. Aft at the flag bag George A. "Gabby" Gammon, originally a signalman, later, Chief Quartermaster. In the hatch to the bridge is John "Jack" Harris. SM2/C. Hardy, Harris and Gammon are deceased. Don Dertien retired with the rank of Captain and lives in Florida. Hardy and Dertien had interesting post WWII career stories. Thanks to John MacDonald for identifying these men. Thanks to Edward Beckham, BT1 and his son Dave Beckham, who emailed this and other photos to me.